Fine-point, inch-long nib is ideal for marking in hard-to-reach spaces. Use for circuit boards, behind fixtures to be installed, screw holes, etc. Nib extends over 1 inch. Instant drying, waterproof, refillable ink. Ruler printed on barrel for convenient measuring. 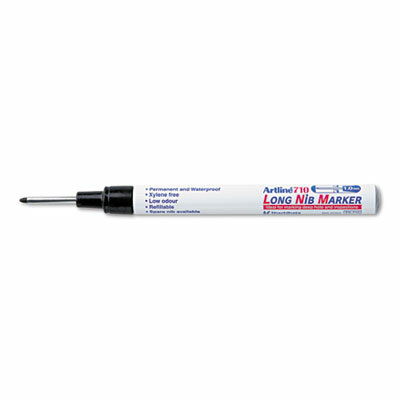 Easily mark those hard-to-reach spaces with this long-nib marker! Perfect for marking spaces such as circuit boards, behind fixtures, screw holes and more. Inch-long nib provides instant-dry, waterproof ink. Printed ruler on the barrel makes measuring convenient. Refillable ink.